This full moon in Capricorn Alphedia has been contacted by the Solar Deities – The Egyptian God Ra, the Greek God Apollo, the Norse Goddess Freya and Aboriginal Goddess Wala – who wish to assist us all through this next moon cycle. 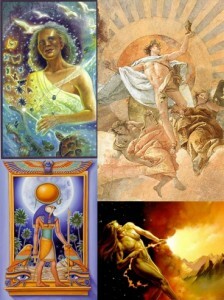 These Solar Deities wish to assist us in harnessing the sun energy throughout this lunar month. “We come together as one voice as a representation of the Solar Deities that can be called upon to assist you at this moon cycle. We come together as you will be attracted individually to different ones of us to work and connect with. For we each are holding a facet of the whole for you to harness the light of this time. The moon being in Capricorn is all about building firm foundations for this later part of the year. To help you harness strength wherever you are in the world from the solar codes as the sun will be releasing more energy over this period with mass coronal injections which bring new codes of consciousness into the universe. It is true the gift of the fire energy and harnessing this that Homo-sapiens have managed to evolve yet many find their fire energy low. Fire aspect becomes out of balance if you are stressed, apathetic, lethargic and lacking passion for yourself and life, low self-worth also can interfere with this. We wish to clear blockages to you being able to have a balanced connection with the solar energy. Those that suffer from depression, SAD syndrome, any fatigue syndrome will benefit from learning to work with us and to harness the solar energies appropriately. Some do not harness it enough and others over use it. The energies of the Planet are increasing in intensity as higher frequency light becomes available for us to harness. The Egyptian God Ra wishes to assist you in harnessing your unique talents and skills. The Greek God Apollo wishes to assist you with moving into acceptance of why you have come to planet Earth this time round. The Norse Goddess Freya wishes to assist you in instilling fire and passion into all that you are and do. The Aboriginal Goddess Wala wishes to assist you in having a deeper connection to the land, to nurture it and to nurture yourself using the gift of solar light. In this workshop Alphedia will channel the Solar Deities live. She will also lead you on a self-realisation exercise, holding the space to allow you to see how to harness more fire and solar energy in your life. And then you will go on a channelled live guided mediation to assist you in maximising spiritual growth potential in this moon cycle. Personal messages will also be channelled through on the night including for those taking part distantly.